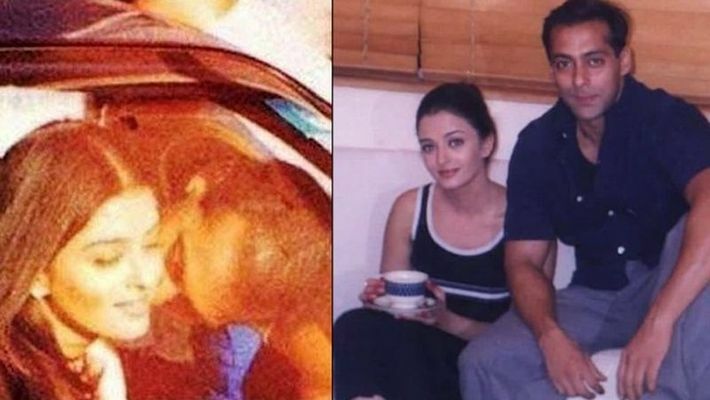 A vintage photo of ex-lovers Salman Khan and Aishwarya Rai Bachchan has surfaced on the internet, and their fans cannot get over it. Mumbai: We can easily say this image is from the days when these two actors Salman Khan and Aishwarya Rai were very close. The time when they were so madly in love, and now both don't even acknowledge each other. Their affair dominated all gossip columns and entertainment magazines. However, their romance had a bitter break-up, which made headlines for years, and continues to even now after they have called it quits. A few days ago, an image has gone viral where we can see both Salman and Aishwariya twinning in the picture. Aish looks beautiful as usual without make-up. On the other side, Salman looks like the boy next door! According to many reports, Salman and Aishwarya's romance bloomed on the sets of Sanjay Leela Bhansali's Hum Dil De Chuke Sanam (1999). And their relationship ended by 2002. In many interviews, Aishwarya had said that Salman used to suspect her for having an affair. She told TOI, "After we broke up, he would call me and talk rubbish. He also suspected me of having affairs with my co-stars. I was linked up with everyone, from Abhishek Bachchan to Shah Rukh Khan." Some reports say that Salman created a scene in front of Aishwarya's Mumbai residence. He has admitted that these reports are true to an extent but media did exaggerate it. According to the book Being Salman, the actor reached Ash's apartment on the night in November, 2001, in a fit of rage and kept banging the door. Eyewitnesses in the same building say that Salman threatened to jump off the building if Ash didn't open the door. Salman banged the door till his hands started bleeding causing Aishwarya to relent and let him in. In an interview with TOI, Aishwarya had said, "There were times when Salman got physical with me, luckily without leaving any marks. And, I would go to work as if nothing had happened. Salman hounded me and caused physical injuries to himself when I refused to take his calls." Today, Salman and Aishwarya have moved on with their lives. Aishwarya is married to Abhishek Bachchan and has a seven-year-old daughter named Aaradhya. There have been many rumours about Salman dating Lulia Vantur.